As usual, we had a friendly welcome and the standard safety briefing from Simon. It’s also becoming quite usual that games at Lucardo begin with some theatrics! The basic premise of this game is that the Dragon’s Heart has been stolen from the University of Magic. It was last seen in Oggles Magic Shop and we were tasked with heading there to find it. The beginning of this game is absolutely fantastic with one of the most unique entrances to a game we’ve seen. I don’t want to give away the surprise because it instantly blew us away. What I will say is that it’s extremely immersive and gives you a very realistic feeling of travelling to Oggles Magic Shop. Once we were inside Oggles, the great immersion continued with some fantastic theming and props. Everywhere you looked there were books, potions, cauldrons and other wizarding paraphernalia. An immersive game like this also needs a good soundtrack, and this game didn’t disappoint with suitably magical sounds to accompany our puzzling. We immediately spotted a large metal gate which we quickly figured out was our primary goal to unlock, so we got to work solving puzzles. All the puzzles we came across in this game worked well and flowed well. What we really loved was the number of special effects in the room that helped to make the experience feel truly magical. 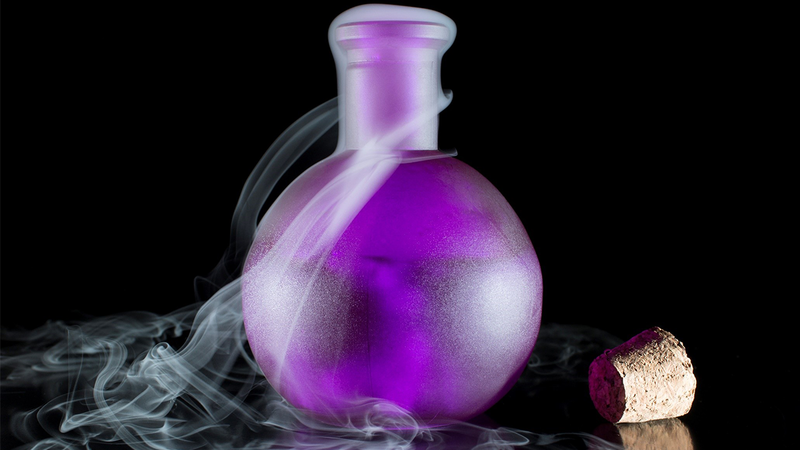 You use wands and potions with very visible effects – such good fun. We eventually proceeded on to the next part of the room and here we experienced a couple of puzzles that we’ve never seen before in 40+ games. Both of them had a really magical feel about them, with a little bit of acting and strong observation skills required! A couple of times in this game, we oddly solved puzzles without actually meaning to just by playing with objects in the room. This is really a game where you need to explore and play with things to solve all the puzzles. 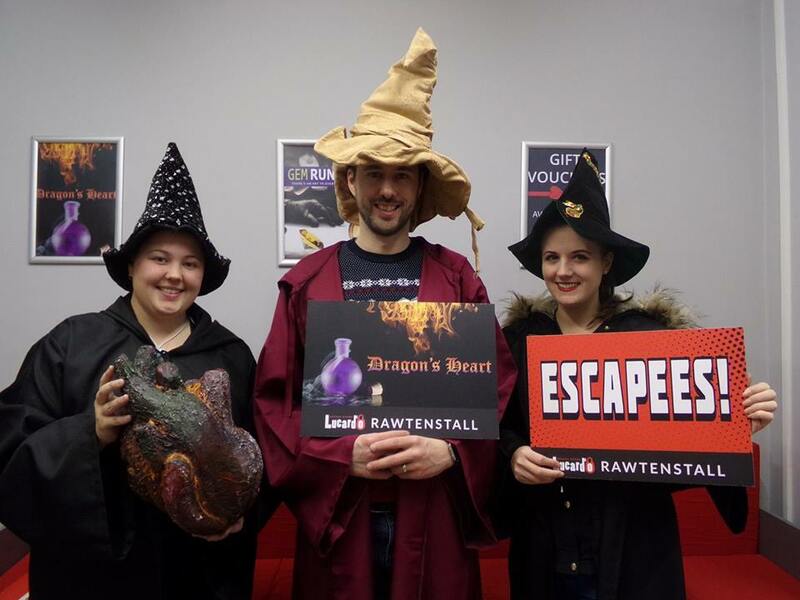 We eventually found the Dragon’s Heart and quickly exited the room with the satisfaction of completing our mission. I was very surprised at the large size of the heart, but after all, it is from a dragon! This really is a must play game for anybody who is a fan of the magical and mystical. From start to finish, this game keeps you immersed and gripped with a great storyline and fantastic theming. They really have gone above and beyond with the design of this room to produce something that feels so real. We had such good fun and continued to talk about the room for days after. A highly recommended game! The team were Merlin, Radagast and Mildred. Overall A truly magical room with lots of great special effects and beautiful theming. Our new favourite Lucardo game! Difficulty It’s a very achievable room for all levels of experience. Everything makes sense and flows well. Fun It’s a very fun room. This room isn’t about testing your wits with tonnes of difficult puzzles – it’s a fun experience designed to entertain and amaze. Puzzles There were some puzzles in this room we absolutely loved – one towards the end of the game stood out as very different. Immersion Before you even begin the game the immersion starts. The detailed theming and unique entrance to the game give it so much realism. We felt immersed from the very first second. Surprises This game starts with a really big surprise and continues to surprise you with great special effects throughout the game.